Many pets are understandably frightened of the bangs and flashes that accompany fireworks. Find out how you can help prepare them for the firework season. Help your dog by creating a comforting ‘den’ where they can hide. This could be inside a wardrobe or cupboard, or behind a sofa. Pad it with old pillows and blankets to soundproof it. In the weeks leading up to firework season, give your dog access to this den at all times. Give healthy treats and praise when your dog uses it to build a positive association. Don’t force your dog to go into the den you’ve made if they prefer a different hiding place. Use a pheromone plug-in nearby. Pheromones are scents that calm dogs but we can’t smell them. They’re available from pet shops. What should I do on firework nights? Take your dog for a walk well before fireworks are due to begin. Keep doors, windows and cat and dog flaps closed. Play music with a repetitive beat to help mask the sounds. Don’t comfort or reassure your pets, even though it’s tempting. They will feel your anxiety and so their fear will be rewarded and encouraged. Never punish your pets. It’s not their fault they’re scared, and it adds to their anxiety. Ensure your pets are microchipped, so if they escape from the home, there is more chance you will be reunited. Don’t pick up cats or restrain them if they are scared: cats prefer to control how they cope. What should I do to help small pets and wildlife? Partly cover hutches and outdoor cages with blankets so they’re more sound-proofed. Make sure your pets have hiding places and secure areas where they can feel safe. Give plenty of bedding – this helps keep noise out and provides a hiding place. Ensure the bonfire is nowhere near any pets. Hedgehogs may think an unlit bonfire is a great place to sleep. Build the fire as late as possible and disturb it around the bottom before lighting to let any wildlife escape. 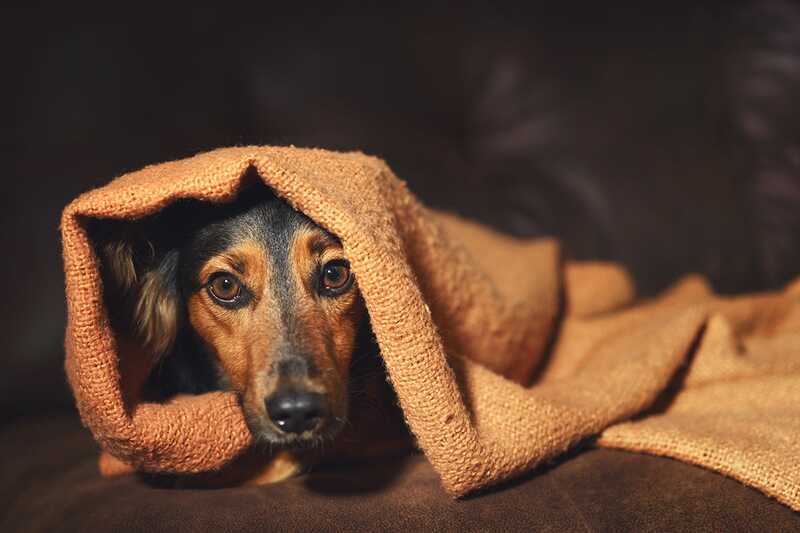 As well as helping your pet on the night, pets that are scared of fireworks and other loud noises can be treated for their fear using effective behavioural techniques. It takes time and patience but can achieve excellent results. Tell your vet about your pet’s fear of loud noises. They’ll thoroughly check there isn’t a medical reason, e.g. thyroid disease. Your vet may recommend behavioural therapy, or suggest referral to a veterinary behaviourist or a pet behaviour counsellor. Behavioural therapy often uses a technique called ‘desensitisation and counter-conditioning’. Over time, this teaches your pet that loud noises are nothing to be afraid of. Sometimes medication prescribed by a vet is used to help with the behavioural therapy. Owners sometimes ask vets to prescribe tranquillisers for their pet. Some drugs that were once popular are no longer used as they don’t reduce fear, just an animal’s ability to respond. This can make a pet’s fear of fireworks even worse.